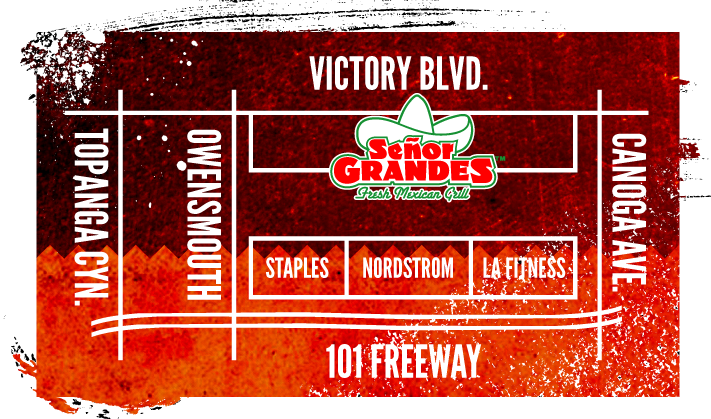 Señor Grandes is a Fresh Mexican Quick Service restaurant that serves fresh quality food and handcrafted salsas in a casual, high-energy atmosphere since 1991. All of our foods are prepared fresh daily and made to your specifications in front of you while you watch. We use only the finest ingredients in all of our meals; including our fresh and healthy breakfast burritos made with egg whites, turkey sausage, fresh veggies and wheat tortillas. Our restaurant staff is warm, friendly and energetic. They are committed to exceeding the expectations of our guests. Our staff members average over 10 years employment with Señor Grandes. Our General Manager, Clement, has been serving our happy customers since 1994! We offer Signature Burritos that cannot be found anywhere else. No one beats our fresh breakfast burrito made with eqq whites, turkey sausage and fresh veggies on a wheat tortilla for only $3.95! Señor Grandes offers a high-quality, extensive menu with countless combinations including our “Build Your Own Meal” and featuring Señor Grandes’ Signature Burritos, Tacos, Quesadillas, Tostada salads, and fresh cut chips. Looking for a meal to get you ready for a work out, or one to end your work out? Check out our fitness plates that include pasta entrées loaded with Carbs or our Protein Power Plate. Quality, quick service (in about 4 minutes) flavor, value, moderate prices and sincere service remain distinct attributes of the Señor Grandes experience. Señor Grandes serves all ages – kids, families, young adults, "baby boomers" and senior citizens – and all income levels. The difference is that at Señor Grandes you get much more for your money! How do I contact Señor Grandes?